The seasonal variation in energy quenching parameters of photosystem II and photoprotective pigments were studied in seedlings and adults of two Proteaceae: a shade-intolerant species (Embotrium coccineum J.R. et G. Forster) and a shade-tolerant species (Lomatia ferruginea (Cav.) R. Br.). We postúlate that the shade intolerant species favors photochemical energy driven processes (mainly C02 assimilation) while the shade tolerant species exhibits higher non-photochemical energy dissipation under unfavorable conditions. Moreover, the shade tolerant species presents lower seasonal variations in these parameters that the shade intolerant species. Differences in energy dissipation should be more evident in seedlings than adults because of their contrasting light environments and temperatures are more evident at this stage. Their maximal photochemical efficiency (Fv/Fm) was in the range 0.70-0.83. The effective photochemical efficiency (<Í>PSII), photochemical quenching (qP), and electrón transport rate (ETR) were higher in seedlings of E. coccineum than in seedlings of L. ferruginea. Adults showed higher photochemical energy quenching parameters than seedlings. 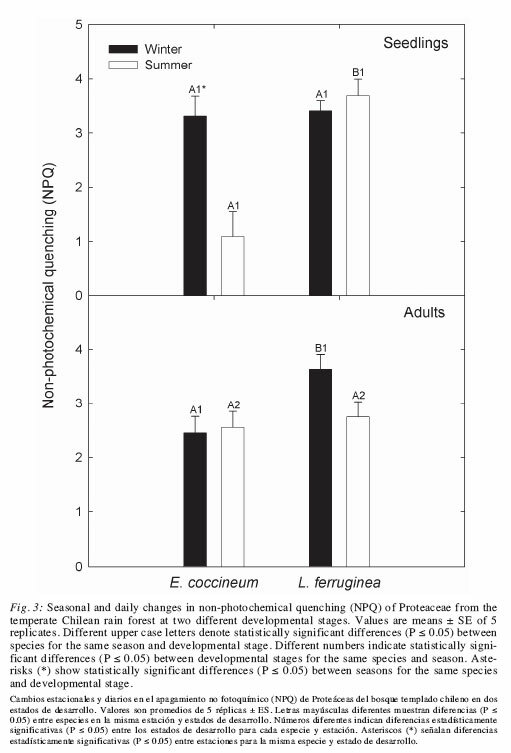 Non-photochemical quenching (NPQ) was frequently similar between daily periods, seasons, species, and developmental stages, with the exception of the lowest non-photochemical quenching in seedlings of E. coccineum in summer. Seedlings and adults showed a larger xanthophyll cycle pool contení at midday in summer than in winter, while the pool of antheraxanthin + zeaxanthin was always higher at midday. Lutein increased the most during summer. Thus, E. coccineum seedlings and adults maintained high photosynthesis, a higher fraction of open reaction centres, and higher ETR than the shade tolerant species. These differences are consistent with the ecological functions of both species: a pioneer character, higher growth rate, and wide altitudinal and latitudinal distribution of E. coccineum compared to L. ferruginea. Key words: chlorophyll fluorescence, lutein, photosynthesis, photoprotective pigments, xanthophyíls cycle. Se estudia la variación estacional en los parámetros de amortiguamiento (quenching) energético del fotosistema II y los pigmentos fotoprotectores en plántulas y adultos de dos Proteáceas con diferente tolerancia a la sombra: Embothrium coccineum J. R. et G. Foster (intolerante) y Lomatia ferruginea (Cav.) R. Br (tolerante). Se prueba la hipótesis que la especie intolerante a la sombra favorece los procesos fotoquímicos de energía conducentes a la asimilación de C02 mientras que la tolerante a la sombra exhibe principalmente una disipación no fotoquímica de la energía ante condiciones de luz desfavorables. Las diferencias en la disipación de energía deben ser más evidentes en plántulas que en adultos debido a que las condiciones de luz y temperatura de sus ambientes son más contrastantes en este estado. La eficiencia fotoquímica máxima de las especies fluctuó entre 0.70-083. La eficiencia fotoquímica efectiva, el amortiguamiento fotoquímico y la tasa de transporte de electrones fue mayor en plántulas de E. coccineum que en las de L. ferruginea. Los parámetros energéticos de amortiguamiento fotoquímico fueron mayores en adultos que en plántulas, pero a menudo similar entre los períodos del día, estaciones, especies y estados de desarrollo, con excepción de menores valores en las plántulas de E. coccineum en verano. Plántulas y adultos presentaron un mayor pool de xantofilas al mediodía en verano que en invierno, mientras que el pool de anteraxantina + zeaxantina fue siempre mayor al mediodía. Luteína experimentó el mayor incremento durante el verano. Plántulas y adultos de E. coccineum mantuvieron una alta fotosíntesis, una mayor proporción de centros abiertos y mayor ETR que la especie tolerante a la sombra. Se concluyó que la especie intolerante a la sombra, E. coccineum, fue capaz de utilizar más de la energía absorbida en la fotosíntesis a través de su ciclo de vida que la especies tolerante. Estas diferencias son consistentes con el carácter pionero, mayor tasa de crecimiento y más amplia distribución altitudinal y latitudinal de E. coccineum con respecto a L. ferruginea. Palabras clave: ciclo de las xantofilas, fluorescencia de la clorofila, fotosíntesis, lutein, pigmentos fotoprotectores. Species of the family Proteaceae are frequent components of the températe rain forest in South Central Chile (Weinberger 1974, Alberdi & Donoso 2004). The climatic and ecological requirements, as well the geographical distribution of the Chilean Proteaceae have been reported by Weinberger (1974). Among the Proteaceae, Embothrium coccineum J.R. et G. Forster (Notro, Ciruelillo) and Lomatia ferruginea (Cav.) R. Br. (Romerillo, Fuinque) have the widest and more austral distribution among Chilean Proteaceae (around 35° to 56° S and 35° to 52° S, respectively). E. coccineum has an important physiognomic role in secondary communities. The light demands of these species are quite different. While E. coccineum is shade-intolerant, L. ferruginea is shade-tolerant (Weinberger 1974). Additionally, E. coccineum can also be a pioneer in lahares (layers of volcanic scoria subjected to high radiation and low night temperatures) (McQueen 1977, Alberdi & Donoso 2004). Contrarily, L. ferruginea regenerates in the forest understory under very humid conditions. (Tausz et al. 2005). Nevertheless, the optimal quantum yield already decreases due photoprotective down-regulation and not only by photodamage (Demmig-Adams 2003). Damage can be shown only if photosynthesis does not recover until evening, which is denominated chronic photoinhibition (Niyogy 1999). Excess energy can be harmlessly dissipated as thermal energy, thus limiting the production of reactive oxygen species (Demmig-Adams & Adams 1992, Adamset al. 2002). In addition to light, other environmental stresses, such as low temperature, water déficit or salinity stress can induce photoinhibition in plants (Bjorkman & Powles 1984, Demmig-Adams & Adams 1992). In these cases, negative effects on the photosynthetic apparatus can occur at low light intensities (Demmig-Adams & Adams 1992). It is accepted that the photoinhibitory responses are due principally to direct effects of the stress factor which can be well expressed by decreases of maximal quantum yield of fluorescence (Fv/Fm) (Demmig-Adams & Adams 1992, Demmig-Adams & Adams 1996, Adams et al. 2002). For example, in winter. when low temperatures limit photosynthetic carbón fixation the normal dissipation of excitation energy through photosynthesis is largely prevented by decreasing chlorophyll (Chl) content (Adams & Barker 1998, Adams et al. 2004, Gilmore & Ball 2000, Savitch et al. 2002) and by increasing thermal dissipation of the excess energy by the xanthophyll cycle (Adams & Barker 1998, Niyogi 1999, Külheim et al. 2002). Although changes in zeaxanthin (Z) and antheraxanthin (A) have been repeatedly reported to be closely correlated with changes in the non-photochemical quenching (NPQ), which is a measure of energy dissipation for plants exposed to high light (Demmig-Adams & Adams 1996), it has been suggested that this relation fails in some plants (Johnson et al. 1993). The xanthophyll lutein (Lut) and its epo-oxidation may also affect the level of thermal dissipation, especially in shade tolerant or shade-semi intolerant species (Matsubara et al. 2008). Other plants can maintain high rates of photosynthesis and the activity of other photochemical processes which serve as electrón sinks reducing potentially damaging excess energy (Savitch et al. 2002, Pérez-Torres et al. 2006). In the case of short wavelengths (e.g. UV-B), the damage to photosynthetic targets can be severe. These relatively high energy photons may disrupt light energy transfer, electrón transport of both photosystems and photosynthetic carbón reduction (Sullivan & Rozema 1999). Although studies about the physiology woody plants with different age are increasing, comparative studies on the seasonal variation in the energy quenching parameters of photosystem II (PSII) and photoprotective pigments in woody species at different developmental stages have not been fully characterized. To the best of our knowledge, most comparative changes on the photochemical energy quenching mechanisms of PSII and xanthophyll cycle pigments in woody and herbaceous species have been done in leaves at different ontogenetic stage, but not comparing individuáis at different developmental stages (Yoo et al. 2003). In this paper, we studied the seasonal variation in the energy quenching parameters of photosystem II (PSII) and photoprotective pigments in seedlings and adults of shade tolerant and intolerant species of Proteaceae (L. ferruginea and E. coccineum, respectively) from the Chilean températe rainforest. We postúlate that under light stress photochemical energy driven processes are favored in shade intolerant species while non-photochemical energy dissipation is the main strategy of shade tolerant species. Moreover, the shade tolerant species show lower seasonal variations in these parameters that the shade intolerant species. This difference in energy dissipation should be more evident in seedlings than adults as the effects of contrasting light environments and temperatures are more accentuated at this stage. The photoprotective strategies used by these species are discussed and related to the light conditions of their biotopes. This study was performed in a forest stand in Parque Katalapi, Pichiquillaipe, 10th Región, in South-Central Chile (41°31' S, 72°45' W), where the two Proteaceae grow naturally. The climate of this área is températe and strongly humid with oceanic influence (Reyes-Díaz et al. 2005, Zúñiga et al. 2006). Seedlings (2-3 year oíd plants) and adults (reproductive plants) of these species were considered in this study. This work was conducted in winter (July) 2005 and summer (January) 2006, at midday, on clear days and predawn. Five individuáis of each species and developmental stages were selected for repeated measurements of fluorescence parameters and net photosynthesis. Fully developed leaves from the leaf cohort from the spring 2004 were used. In adults, leaves were taken at similar heights and NE exposure. Climatic parameters were controlled with a Licor data logger (LI-1400) equipped with sensors for air temperature and relative humidity (LI 1400-104), and rain (LI 1400-106). Photosynthetic active radiation (PAR) (^imol m 2 s_1) was controlled in the microhabitats of the selected seedlings and adult plants at each season at midday (solar time) with a Li-Cor LI-189 digital quantum radiometer/photometer fitted with a quantum sensor (LI-190SA). At least 15 measurements were made at the top of the seedlings and above the twigs of adults during this time, without exclusión of shade and reflectance from other leaves. PAR measurements at open field were also made. With these data, the light environments for both species (as percentage of the light at the open field) were characterized. Light response curves of net photosynthesis of attached leaves were made using an infrared gas analyzer (IRGA; Ciras-1, PP system; Hitchin, UK). External air was scrubbed with CO2 and mixed with a supply of puré CO2 to reach a reference concentration of 360 ppm. with a flow rate of 200 mL minA and 80 % external relative humidity. The relative humidity valué is representative of the humidity at the study site, as indicated by the measurements with the Licor data logger (LI-1400). The light response curves of photosynthesis were obtained by 17 irradiance valúes over a range between 0 and 2000 [xmol m 2 s"1 given by the PLC6(U) light unit, PP-systems Hertfordshire, UK. In situ measurements of chlorophyll fluorescence of PSII were made with a portable pulse-amplitude modulated fluorometer (FMSII, Hansatech Instruments Ltd., Norfolk, UK). Comparable leaves as those used for IRGA determinations were selected for the fluorescence analyses. The protocol of Reyes-Díaz et al. (2005) was followed. Fluorescence of attached leaves was measured after dark adaptation for 30 min (to obtain open centers) with leaf-clips provided by a mobile shutter píate. Then the fiber-optic and its fiber-optic adapter were fixed to a ring located over the clip at about 10 mm from the sample and light pulses were applied. Basal fluorescence (Fo) was determined by applying a weak-modulated light (0.4 [xmol photons nr2 s_1) and maximal fluorescence (Fm) was induced by a short pulse (0.8 s) of saturating light (9000 \i mol photons nr2 s_1). After 10 s, actinic light (500 \ivao\ photons nr2 s_1) was turned on to obtain fluorescence parameters during steady-state photosynthesis. This irradiance was selected based on previous determinations of the light saturating curve for PSII in both species (not shown). The use of similar irradiance in both species allows a more standardized comparison than variable natural light. Thus, the differences during long-term exposition to the local irradiance climate will be better represented in the species than the episodic short term irradiance. Definitions of fluorescence parameters (qP, NPQ, Fv/Fm and <I>PSII were used as described by Maxwell & Johnson (2000). The máximum quantum yield of fluorescence (Fv/Fm) is defined as the ratio variable fluorescence/maximal fluorescence and represents the maximal photochemical efficieney of PSII when all the centres are open (dark conditions) and the effective quantum yield (<I>PSII= (Fm' - Fs)/Fm') represents the photochemical efficieney under light conditions, that is when photosynthesis oceurs (Genty et al. 1989). Electrón transport rate was estimated as: ETR= PAR x 0.5 x OPSII x 0.84 following the indications provided by the OMSII user's manual (Hansatech, UK). This parameter is also denominated relative electrón transport (rETR, Schreiber et al. 1994). PAR used was 500 [xmol photons m 2 s_1. Photochemical quenching (qP) was calculated as: qP= (Fm' -Fs)/(Fm' - Fo'), with Fm' being the maximal fluorescence in light adapted leaves, and Fs the steady state fluorescence yield. Non-photochemical quenching (NPQ) was determined at midday and calculated as: NPQ= (Fm - Fm')/Fm' (Bilger & Bjorkman 1990, Maxwell & Johnson 2000). When steady state fluorescence was reached, saturating pulses were applied to obtain Fm'. After fluorescence measurements, the same leaves were detached and immediately placed in liquid nitrogen and kept frozen at -80 °C until pigments analyses. Pigments were extracted with 100 (v/v) HPLC grade acetone at 4 °C under a green safelight. After centrifugation (5.000 g) at 0 °C for 3 min, the supernatant was filtered through a 0.22-[xm syringe filter and samples were stored at -80 °C until analysis. One aliquot was used for spectrophotometric determinations of chlorophylls a (Chl a) and b, (Chl b) and total carotenoids (with a Metertek SP 850 spectrophotometer, Taipei, Taiwan), using the extinction coefficients and equations determined by Lichtenthaler & Wellburn (1983). A second aliquot was used for xanthophyll analyses. They were separated and quantified by HPLC (Hewlett Packard 1100, Agilent Technologies Inc, San José, CA, USA) according to the method described by Gilmore & Yamamoto (1991) with minor modifications (Zúñiga et al. 2006). 50 \iL of the extract were injected in a Zorbax Rx-C18 reversed phase HPLC column (250 x 4.6 mm ID, 5 [un particle size) protected by a Zorbax Rx-C18 guard column (12.5 x 4.6 mm ID, 5 [tm). For separation, a mobile phase consisting of two components was used: solvent A. acetonitrile:methanol:buffer Tris-HCl 0.1 M pH 8.0 (72:8:3 v/v) and solvent B, methanokethyl acétate (68:32 v/v). Pigments were eluted using a gradient of solvent A, running isocratically for 6 minutes, followed by 10 minutes of a linear gradient up to 100 % of the solvent mixture B and 4 minutes of isocratic mixture of the last solvent. The retention times and response factors of pigments of violaxanthin (V), antheraxanthin (A), zeaxanthin (Z) were measured by using standards provided by DHI Water and Environment, Copenhagen, DK. Lutein (Lut) standards were obtained from Sigma, St Louis, MO, USA. All standards were in ethanol. Concentrations of xanthophylls were expressed on Chl a + b basis. Epoxidation state (EPS) of the xanthophyll pool was calculated as: EPS= (V+ 0.5A) / (V+A+Z). Determinations are based on 5 replicates. corresponding to 5 individuáis in each species (n = 5). All data passed the normality and equal variance tests after the Kolmogorov-Smirnov test. The data were analyzed by two-way repeated measures analyses of variance (ANOVA) to test the effects of season and development stage on pigments, photosynthesis rate, and chlorophyll fluorescence. A Tukey test was used to identify those means with significant differences. The software Sigma Stat 2.0 software (SPSS® Inc, Chicago, IL, USA) was used for both analyses. Differences between the valúes were determined at P < 0.05. Spearman correlations (rs) were made to establish relations between some parameters with the same software mentioned above. Rainfall during the austral winter reached 731 mm in June, July and August, while in summer valúes decreased to 278 mm in December, January and February (Fig. 1A). Máximum air temperatures in summer were cióse to 30 °C, while in winter minimum valúes were cióse to -2 °C (Fig. 1B). Irradiance at full light between winter and summer were approximately 30 % less in winter than in summer (Table 1). Seedlings of E. coccineum received 73-74 % irradiance with respect to the light in the open field in winter and summer, respectively, whereas adults of this species received 93-94 %. For L. ferrugina seedlings, irradiance relative to those of open field, was around 10 % in both seasons. In the case of adults, valúes were 46 % in winter and 39 % in summer. The irradiance over seedlings was lower than in adults due to shading and probably by different reflectance. Relative humidity (RH) at midday was about 75 % in summer and 80 % in winter. Temperatures of air surrounding leaves were 3 °C to 6 °C in winter, whereas in summer they peaked up 12 °C for seedlings and 16 °C for adults. The photosynthetic rate was higher in summer than in winter in both developmental stages, with the exception of seedlings from the shade tolerant plants (Fig. 2). The highest photosynthetic rates were found in seedlings and adults of E. coccineum (P < 0.05). 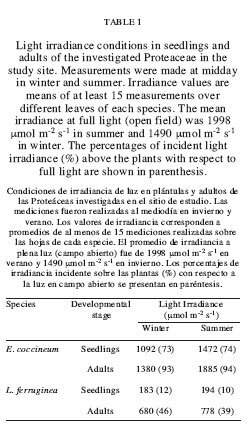 Light saturation points for photosynthesis were around 500 ± 64 [xmol photons m-2 sA for seedlings and adults of E. coccineum and 250 ± 31 and 480 ± 93 \ivao\ photons nr2 sA for seedlings and adults of L. ferruginea, respectively (Fig. 2). Seasonal differences between the xanthophyll pools (VAZ) at both developmental stages were found at both daily periods (Table 3). Violaxanthin (V) decreased from predawn to midday in the two seasons in seedlings and adults of both species, with the exception of adults of E. coccineum in summer. Antheraxanthin + Zeaxanthin (A+Z) contents increased from predawn to midday in seedlings in winter and summer. The same pattern was observed in adults, with the exception of the shade tolerant L. ferruginea in winter and the heliophyte E. coccineum in summer. In summer, the VAZ pool increased from predawn to midday in seedlings and adults of the two species. The reverse pattern was observed in winter, when VAZ valúes decreased (Table 3). The highest VAZ pools were found in adults of L. ferruginea at midday in summer (P < 0.05), and in winter, in both development stages of E. coccineum at predawn (P < 0.05). Lutein valúes were much lower in winter than in summer (Table 3). Lutein contents decreased at midday in summer compared to predawn in seedlings. In adults, little increases were found at midday with respect to dawn, with the exception of the shade tolerant species that increased its lutein content by 41 % (Table 3). Daily differences in the EPS were found in seedlings and adults of the two species with higher valúes at predawn than midday in both seasons (P < 0.05). 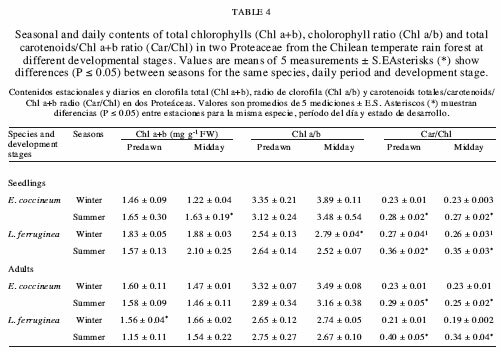 In adults of E. coccineum in summer, no differences between the daily periods were found (Table 3). In the case of developmental stages, differences were found in winter at midday in the two species, showing adults of L. ferruginea a lower EPS than seedlings (P < 0.05). In contrast, adults of E. coccineum had the highest EPS at predawn (P < 0.05). In summer, the highest EPS valúes at midday were determined in adults of E. coccineum. of thermal energy dissipation that allows these plants to cope with periods of high light in tropical forest gaps. Our study is one of the first field studies on photoprotection performed in the températe rainforest of the Southern Hemisphere examining plants at different ontogenetic stages. It was demonstrated that in summer, the optimal photochemical efficiency (Fv/Fm) was within the physiological ranges for healthy leaves (0.80-0.84) (Bjórkman & Demmig 1987) at both developmental stages. In winter, seedlings and adults of E. coccineum showed statistically significant lower ~14 % (P < 0.05) Fv/Fm valúes than in summer. Thus, Fv/Fm of seedlings and adults of the shade-intolerant E. coccineum seems to be more perturbed during the coldest season. This response may be explained by a combination of low temperature and modérate light as additional stress can exacérbate the detrimental effect of light (Bilger & Bjorkmann 1990). This pattern is consistent with the semidecidous character of E. coccineum, but not in L. ferruginea (Weinberger 1974). Nonetheless. Fv/Fm valúes of 0.70 are considered within the normal range for trees (Mohammed et al, 2003) and therefore it can not be interpreted as photodamage, but as a regulatory adjustment of PSII efficiency (Huner et al. 2002). In contrast, the evergreen Nothofagus dombeyi from the Chilean températe rainforest showed a decrease in Fv/Fm in summer at the highest irradiances (midday) (Zúñiga et al. 2006), but not in winter as was found in our study for L. ferruginea and E. coccineum. Because this decline was reversed in the afternoon in N. dombeyi, these authors suggested a photoprotective down regulation of the PSII mediated by Z, thus preventing the damage of the photosynthetic system as reported by other authors (Adams & Demmig-Adams 1994, Krause & Winter 1996). In our case, there was only a small decrease in Fv/Fm in seedlings and adults of E. coccineum in winter. 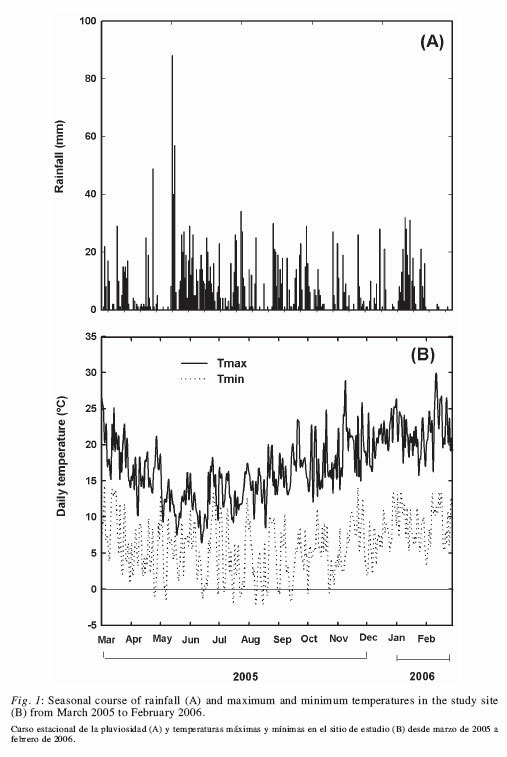 The lower NPQ (thermal energy dissipation) showed in seedlings of E. coccineum in summer at midday (Fig. 3) is concomitant with a higher OPSII, qP and ETR of this species (Table 2). Thus, in summer, E. coccineum showed a higher utilization of the absorbed energy in electrón transport and therefore higher C02 assimilation than L. ferruginea (Fig. 2). This supports well the pioneer and heliophyte features of E. coccineum (Weinberger 1974). In seedlings and adults of the investigated species, the midday NPQ was negatively correlated with OPSII and qP, (rs = -0.9 P < 0.05), as found in other plants (Demmig-Adams & Adams 1996). On the other hand, NPQ was higher in winter than in summer in seedlings of E. coccineum and L. ferruginea concomitant with a lower photosynthesis, OPSII, ETR and qP. According to Adams et al. (1995), NPQ reaches higher levéis at temperatures that severely slow down photosynthesis rates. It is known that changes in NPQ are closely and directly correlated with changes in A+Z in leaves exposed to high light (Bilger & Bjorkman 1990, Gilmore & Yamamoto 1993, Demmig-Adams & Adams 1996, Stroch et al. 2008). It has also been suggested that the xanthophyll cycle can be unrelated to NPQ, because no direct quantitative relationships between Z or A+Z levéis and NPQ exist (Johnson et al. 1993). Our results did not support the first assumption because the investigated Proteaceae showed no correlation between NPQ and A+Z (rs = -0.28, P > 0.05). Therefore, it appears that the relation between NPQ and the increase in A+Z may not be common to all plants. The xanthophyll cycle facilitated energy dissipation is complex and variations of this process can be expected according to the different genetic and ecological context of different plants species (Demmig-Adams & Adams 1992, 1996). There appears to be a high proportion of nocturnal retention of A+Z in these two Proteaceae, similar as has been found in N. nítida, a species from the Chilean températe rainforest (Zúñiga et al. 2006). Sustained retention of large amounts of A+Z appears to be a common response to low temperature stress under field conditions in plants (Adams & Demmig-Adams 1994, Adams & Barker 1998, Verhoeven et al. 1999). The de-epoxidation of V to A and Z increases strongly in cold acclimated pine needles as reflected by decreasing valúes of the EPS (Savitch et al. 2002). Contrarily, we found higher or similar EPS in winter than in summer at both developmental stages. This suggests that under the relative milder winter temperature conditions of South- Central Chile with respect to the Northern Hemisphere, de-epoxidation of V to A+Z is not enough to produce a strong decrease in EPS. In this work, the daily changes in xanthophyll pigments seem to be more important than seasonal variation (winter compared to summer). Our results suggest a cióse relationship between irradiance and changes in xanthophylls pigments (Demmig-Adams & Adams 1996). This response has often been observed in a wide range of plant species growing in natural sunlight (Demmig-Adams & Adams 1992, 1996, Adams et al. 1999). Another important photoprotective and accessory pigment is Lut (Matsubara et al. 2008). Our results showed that the higher concentration of this carotenoid occurred in summer, concomitant with a higher photosynthesis. This is different that found in plants of colder climates of the Northern Hemisphere, where accumulation of Lut occurs during cold acclimation in winter (Adams & Demmig-Adams 1994, Verhoeven et al. 1999, Savitch et al. 2002). Interestingly, a progressively high Lut summer induction associated with an increase of the VAZ pool, reaching a peak during a heat wave, was recently reported for the Mediterranean evergreen Buxus sempervirens (Hormaetxe et al. 2007). From the comparison of these results with those of a non-stressful summer, these authors concluded that the summer increase in Lut of B. sempervirens was not strictly seasonal. In our study, lutein accumulated more in summer than in winter at both developmental stages, regardless of the species suggesting a general photoprotective role in Proteaceae. Lut accumulation is only related with a higher VAZ pool in adults of the shade-tolerant L. ferruginea. The higher Lut contents in summer could represent a specific adaptation to cope with the variable light environment (sun flecks in the case of the more umbrophyllous species and high light intensities at midday in the case of the heliophyte species), prevalent in the evergreen températe rain forest of the Southern Hemisphere. Recently, Matsubara et al. (2008) reported an increase in Lut content in response to excess light that may enhance photoprotection in leaves of tropical tree species. It has been reported that Z could be equivalent to Lut in energy dissipation in Quercus ilex subsp. ballota (García-Plazaola et al. 2002, Corcuera et al. 2005). Nevertheless, our results showed extremely high leaf lutein levéis in summer without a concomitant increase in NPQ at saturating light. It is likely that 500 [xmol photons nr2 sA (a valué much lower compared to the summer natural levéis), was not enough to trigger the whole NPQ plant capability. Further studies using over saturating or even photoinhibitory photon fluxes will be necessary to clarify the NPQ and Lut relationship. The frequently higher total Chl contents on a fresh mass basis in L. ferruginea and a lower Chl a/b ratio agree well with its shady habitat preferences (Table 4). This has been previously observed in other umbrophyllous plants in relation to those growing in more illuminated places (Evans 1988, Logan et al. 1998). The Chl a/b ratio is smaller in shade acclimated leaves, which have more chlorophyll associated with the light harvesting complex (LHC) than with the reaction centres (Evans 1988). Thus, a decreased Chl a/b ratio may be the result of a greater investment in the LHC in the umbrophyllous L. ferruginea. A positive correlation was found between the Chl a/b ratio and the light percentage (with respect to the open field) that the species received in their microhabitats (rs = 0.78 P < 0.05). This corresponds well with the findings in sun and shade plants (Evans 1988). The more evident differences between developmental stages of the studied species were found in some photochemical energy quenching parameters. 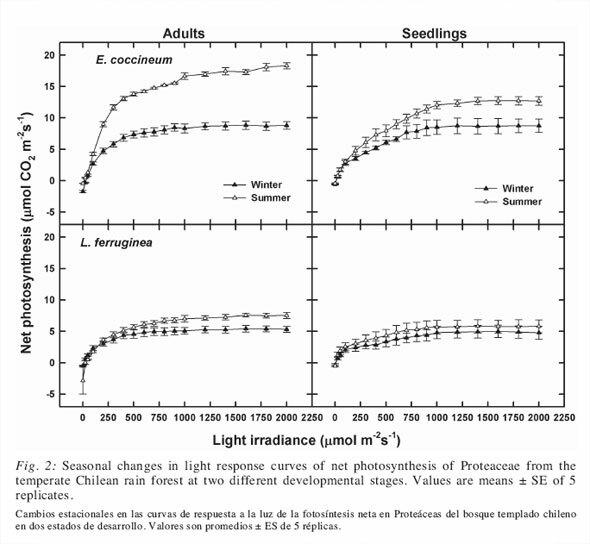 In general, seedlings of the umbrophyllous species increased their photosynthetic parameters as they reached adulthood (Table 2). This may be relevant to the transition from shade to a more lighted environment that seedlings undergo as they reach adulthood, as suggested for N. nítida (Coopman et al. 2008). Thus, this plant changes the balance of light energy utilization during its development, supporting its capacity to grow in more illuminated environments. The small differences in net photosynthesis at 500 [xmol photons nr2 s_1 (Fig. 2) in contrast to differences in ETR valúes at midday (Table 2) found among developmental stages of L. ferruginea suggest that other photochemical processes, such as Mehler reaction or photorespiration, are occurring (Pérez-Torres et al. 2007). This was not always the case for the heliophyte, which appears to decrease these parameters in adults in summer with respect to the seedling stage. Therefore, it is difficult to predict adult photosynthetic performance from measurements made in seedlings. Nonetheless, these parameters and photosynthesis rate reflected the typical differences between sun and shade species at the seedling stage, with higher valúes of net photosynthesis, OPSII, qP, and ETR in E. coccineum (sun plant) than L. ferruginea (shade plant). These species showed a similar response when growing at similar light intensity in the laboratory (Castro-Arévalo et al. 2008). Thus, we concluded that the shade intolerant E. coccineum was able to use more absorbed energy in net photosynthesis throughout its life cycle than the shade species. This is consistent with the pioneer character, higher growth rate, and wide altitudinal and latitudinal distribution of E. coccineum compared to L. ferruginea. L. ferruginea adjusts its photochemical attributes (qP, ETR, and OPSII) during its transition from seedling to adulthood, which allows it to recruit in the shade and further survive in a more lighted environment. These photosynthetic attributes may be pivotal for recruitment and the succession status of a species in terms of pioneer or climax regeneration strategies. The support of FONDECYT 1050640 is gratefully acknowledged.